The Honeywell RTH221B thermostat is a one-week programmable thermostat. After you set the program for the heating or cooling season, you never need to adjust the thermostat unless you change your own schedule. There are only four program schedules for the RTH221B Honeywell thermostat, making it easy to program even if you've lost your Honeywell 1 week Programmable Thermostat manual. Before you program your new Honeywell thermostat, you need to install it. The installation process is the same for all Honeywell models RTH2300 and RTH221. First, turn off the power to your heating or cooling system. Take away your old thermostat, but leave the wallplate with the wires attached. The manual includes a Honeywell RTH221 wiring diagram, so if you don't have this to hand, make sure you correctly identify the wires. 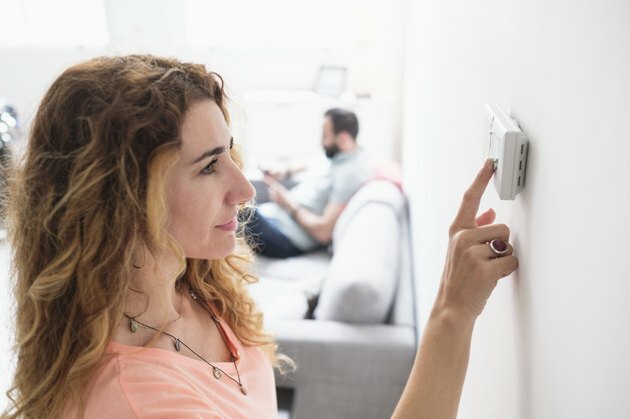 If any wires are not attached to your old thermostat or are attached to a terminal marked C or C1, they will not connect to your new thermostat. Fix electrical tape around the bare metal end of each of these wires so it cannot touch other wires and cause a short circuit. The wire colors are not relevant. Instead, use the terminal screw designations for identification. After you have labeled all wires, you can disconnect wires and remove the old wallplate. To mount the new wallplate, loosen the locking screw at the bottom of the thermostat. Separate the thermostat from the wallplate and position the wallplate against the wall. Use a pencil to mark the hole positions, then drill holes at the marked positions and put in the wall anchors supplied with the thermostat. Insert the wires through the large opening at the bottom center of the wallplate, then attach the wallplate to the wall, using the mounting screws supplied with the thermostat. To complete the Honeywell RTH2300 RTH221 installation, connect the wires to the terminals. Pair each labeled wire with the corresponding terminal. Use a screwdriver to loosen the terminal screws, insert the wires and tighten the screws. Push any remaining wire back into the wall opening. If you have connected a wire to the G terminal, set jumper JP1 on the back of the thermostat. If you have a gas or oil furnace, leave the jumper in the factory-set position HG. If you have an electric furnace, move the jumper to position HE. If you have a heat pump, set jumper JP2 on the back of the thermostat. If you have connected an O wire to the O/B terminal, leave the jumper in the factory-set position O. If you have connected a B wire to the O/B terminal, move the jumper to position B. On the back of the thermostat, install two AAA batteries. Align the two brackets on the top of the thermostat with the corresponding slots on the top of the wall plate, then push the thermostat against the wallplate. Tighten the screw at the bottom of the thermostat. You can now turn the power to the heating/cooling system back on. You can set a different temperature on your Honeywell RTH221B for when you wake up, leave the house, arrive home and go to bed. The mode switch is on the right side of the Honeywell RTH221B thermostat. Turn this to "Cool" or "Heat" depending on the season. The thermostat has three buttons on the top left-hand side. The first of these is the "Set" button. Press and release this button twice to put the thermostat into programming mode. Press this button once to put the clock into programming mode. Press this button twice to display the time of the "Wake" setting on the thermostat's screen. To make the wake time earlier or later, hold one of the directional buttons below the screen. As soon as you reach the time you want the "Wake" setting to start, release the directional button. Press and release the "Set" button again to access the next programming period. Follow the same steps to set the remaining three programming periods. When you have programmed all periods, press and release the "Run" button.